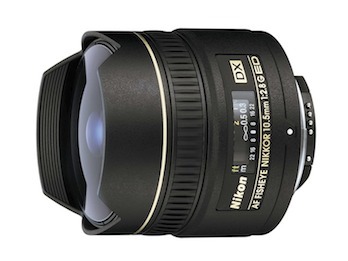 The Nikon 10.5mm f/2.8 G AF DX is a high performance, autofocus, fisheye lens with a 180 degree wide angle of view. The fisheye perspective gives an extraordinary, full-circle vision, impossible to see with normal lenses. Straight lines become curved and angles distorted as this lens captures sky, ground, left and right in a single image. The Nikon 10.5mm fisheye is great for both creative and for practical uses to capture wide angles of large subjects impossible to frame with a normal lens. The autofocus mechanism of this lens requires a camera body with autofocus motor and drive screw. A list of compatible Nikon D-SLR camera bodies can be found here. This lens can be focused manually on cameras that do not have an autofocus motor. AF: The Nikon AF autofocus system of this lens is not compatible with Nikon cameras without a built-in autofocus motor and screw. The lens can be focused manually with these cameras.